Powers/Abilities: He was able to create things from his mind and warped reality and time. (Marvel Comics Presents#167 (fb)): Forty years ago the Writer felt immortal. After two novels and three plays he was on his way to Hollywood. In six months he made the money for ten years and bought a house because he could and because he wanted a place where he could write his next novel. He threw many parties in his new house. There were always more morsels of gossip to savor and more guests to meet for him. On his parties he talked-up his next novel to agents and publishers and even told them that he already had the title "Behold the...". It should've been a sprawling family saga that would lay bare the soul of America, but it was never finished. He only made notes and false starts over the years, but the parties never ended and he didn't find the time to write the book. (Marvel Comics Presents#167 - (fb) BTS): At some point people didn't come anymore to visit him. The Writer withdrew into the East Wing of his big house and blocked the shutters of the wing with boards. He lost his will to live and became bedridden. He was on the brink of death when he got his last chance to end his story with the help of the Man-Thing. (Marvel Comics Presents#164/1-166/1 - BTS): The Man-Thing was knocked out by the powerful emotions of the Writer who split the unconscious Man-Thing into Ted Sallis and the monster. Sallis woke up again and didn't remember much about his past. He was stunned by his returning mind and stumbled into a picnic of the Writer's characters like it was planned. He made Sallis interact with his characters only for a few seconds which seemed like three months. 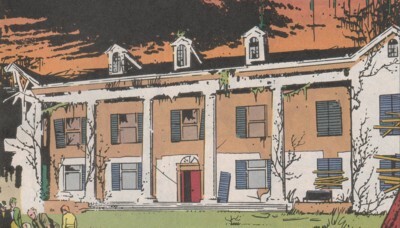 The Man-Thing followed Sallis and attacked the fearful characters in the moment when Sallis wanted to enter the mysterious East Wing of the house where the Writer lay in his bed. Sallis was drawn into the Man-Thing again and saw his own life flash before his eyes, but he resisted and parted again with it. He wasn't able to stop the monster from killing the lad Martin. 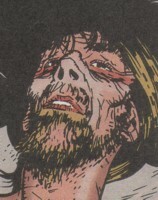 (Marvel Comics Presents#167/1): The Writer lay in his bed and thought about his approaching death. He saw dark waters rise around him and felt relief. He remembered his past and the people that distracted him over the years from writing. Sallis followed Man-Thing into the house. The monster entered the East Wing and was attacked by the distracting guests the Writer remembered. Sallis felt their attacks on Man-Thing like he was attacked and even began to bleed. Man-Thing burned them and broke through another door. Sallis followed the monster, but suddenly it was gone. He found the Writer in his bed and read his notes and false starts for the novel. He realized that all the people he met in this estate were characters the Writer created from his mind. Sallis wanted him to give him back Genevieve, but the Writer was dead. He was still warm and Sallis knew that it didn't take three months to die and that even time was an illusion on this estate. Sallis now understood that everything he experienced was the wish-fulfilment of a blocked Writer, but he didn't want to believe that he wasn't real too. Sallis ran to the outside and screamed his name while he turned into Man-Thing again. There were other characters of the Writer in this story as well, but they didn't play a big enough role and the most didn't even get a name. There was another woman at the picnic (never seen again) as well as a couple (Eddie and Phil were killed by Man-Thing shortly before Genevieve) and the dog Mutt (it was Elijah's dog and also died through Man-Thing). There were also the party guests that turned into monstrous beings and attacked the Man-Thing (they were also killed by Man-Thing). Except for the couple none of these were named. I am not sure about the origin of the Writer's powers. He could've been a mutant, but it is also possible that he was somehow mutated because he lived too near to the Nexus of All Realities for so long. It is also not clear when his powers manifested or for how long he was already living alone among the creations of his mind. It could've been a disease, he could've starved himself to death or he just wished to die as the finish for his book. The latter could be the reason why he brought in the Man-Thing (to kill all characters for a tragic ending). I gave no last names to Elijah and Martin as it was not stated that they were relatives of Genevieve and even if they were they didn't had to be named Beaumain like her. In my opinion this storyline was confusing, but well done. The title of the Writer's third book was probably meant to be the title of the story arc "Behold the Man". In the story only the part "Behold the ..." was mentioned. I generally liked the story and I was not the only one. The feedback in following issues was positive. It was still hard to understand the intentions of the Writer and how he became the person he was in the end. Elijah was with the other characters of the Writer out for a picnic and wanted to know who Sallis was when he dropped in. He became friends with Sallis over the next months. He heard Genevieve scream one night and ran with Ted and his dog Mutt to the outside where they saw their dead friends and the Man-Thing. Elijah wanted Ted to stay out of the monster's reach because burnt everything with a touch. Elijah wanted Ted to hold back Mutt for him so that he could get a straight shot at the monster. He saw Man-Thing attack Ted and lost the grip on his dog's leash. Mutt was killed with one hit by Man-Thing and Elijah shot at the monster. Elijah failed to reload his rifle for the first time in twenty years and Man-Thing burnt him when it felt his fear. Elijah died. Genevieve was with the other characters of the Writer out for a picnic when Ted Sallis stumbled onto the scene. She checked on him when he fell to the ground and told the others that he was alive and famished. She was the first to speak with Ted and told him that he had to rest a few days at their place. She took care of him for the next days and after he was well again she grew closer to Ted and fell in love with him. After three months he asked her to come with him, but she told him that she couldn't. She didn't know why and went to the outside to get some air. She asked Ted not to follow her. She was attacked outside by the Man-Thing which had already burnt Phil and Eddie. Genevieve was burnt too by the touch of Man-Thing. She didn't survive the attack. Martin was with the other characters of the Writer out for a picnic when Ted Sallis suddenly appeared. He watched him for the following three months and didn't speak to him at all until Ted asked Genevieve to come with him. Martin stopped Ted from following Genevieve and told Ted to leave because he was not part of the plot. He left Ted wondering what he meant. 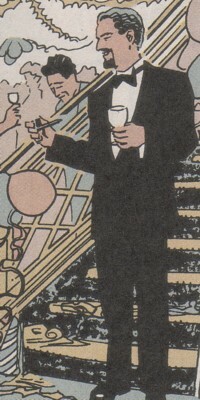 He stood in the doorway after everyone else had died and told Ted he spoiled everything they waited for all these years. Man-Thing moved towards the boy and he burnt to death without the monster even touching him. The Writer bought this house in the swamps nearly forty years ago. The only inhabitant was the Writer himself. He lived in the East Wing. The shutters of the East Wing were blocked with boards nailed onto them. He had many guests over the years in the house. When guests didn't come anymore the house began to crumble, plants overgrew the facade and the shutters began to fall down.